Substantially improve the characterization of world food security due to climate change and to enhance adaptation capacity in both developing and developed countries. Climate: Support agricultural and economic systems modeling by developing historical climate information, crop-climate sensitivity studies, and suitably downscaled future climate projections needed for rice and sugarcane crop and economic modeling in Sri Lanka. Crop Modeling: Implement and refine multiple crop models for rice and sugarcane to enable inter-comparison and assessment of predictive skill and uncertainties. Develop projections for crop yields under climate change projections while assessing uncertainty at selected locales. Economic Modeling: Implement the “Tradeoff Analysis Model for Multi-Dimensional impact assessment (TOA-MD)” and similar models to assess impacts on food security due to climate change in selected rice and sugarcane farming systems. Assess sensitivity of outcomes to socio-economic scenarios (Representative Agricultural Pathways (RAPs)). Develop methods to integrate climate and crop yield variability and change assessments and RAPs into integrated crop, agriculture sector and food security assessments at sub-district, district and national levels in Sri Lanka. Information Technology: Develop an IT system that enables the modeling and collaborative work at five institutions with the support of the AgMIP team. The IT system shall help to manage data in consistent formats, support software tools, support model inter-comparisons, undertake knowledge management and use the web to communicate results. 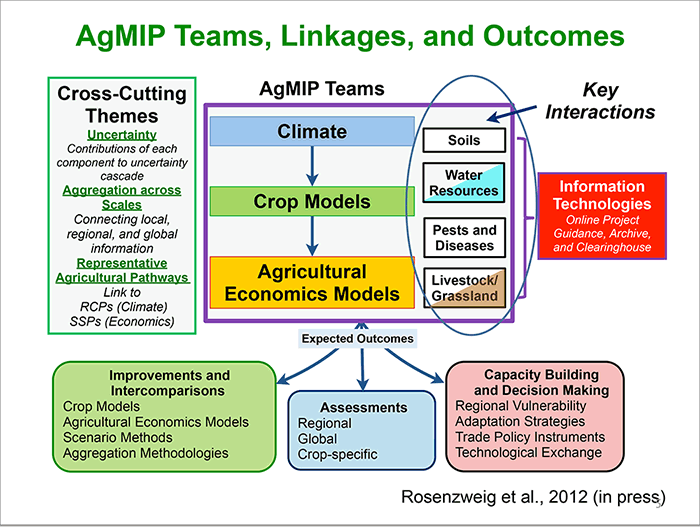 Contribute expertise to the AgMIP program. Communication of Research and Capacity Building: Generate collaborative research outputs and provide interpretations of these findings to inform policy making. Develop modeling capacity among the project team and undertake training in climate, crop and economic modeling. Advancement of state of- the-art modeling of the impacts of a variable and changing climate on agriculture and food security at multiple scales to inform policy-making and resource management. Harnessing of high quality data resources and expertise in Sri Lanka to contribute to global efforts to characterize the impacts of a variable and changing climate on agriculture. Development of expertise, infrastructure, data and IT resources for climate, crop and economic modeling in the partner universities, departments and research institutes. programs and access to project resources and outputs. Rice : Kurunegala (for Fast-track) and other growing areas, Anuradhapura, Polonnaruwa, Batticaloa, Ampara, Hambantota, Kalutara and Matara districts would be focused, following the fast-track exercise. Sugarcane : Pelwatte and Sevanagala (for Fast-track) and other growing areas, Trincomalee and Kilinochchi districts would be focused, following the fast-track exercise. Crop model used for this exercise would be DSSAT, whereby crop models APSIM and INFOCROP would be performed in parallel. Crop yields for the selected location and crop yields for one climate change scenario (2040-2069) are to be simulated. Economic modeling would be carried out with the use of Tradeoff analysis software (TOA-MD) and DevRAP software developed by Oregon state university, USA.